Looking for some cause for jollity in a dreary January I thought I would take a humorous look at a piece written by the French Marxist philosopher, Bernard-Henri Lévy, signed by, according to The Guardian, '30 top intellectuals'. The piece was circulated widely, even the now Remainer-supporting Daily Mail doing its bit. Yes, I know, French philosophers are an easy target, one that may be unworthy of us, mocking them being rather like pulling wings off flies. Experience has shown that it is best to ignore anything coming from the mouths or the pens of the Marxist philosophers who infest the cultural life of France. Equally, any opinion or report appearing in that house newspaper of the French gauche caviar, Libération should be binned unread. Well, there are plenty of things to mock there – the criticism of the 'abstractions' used by the hated nationalists made by an author who is happy to use them for his own purposes in the 'idea of Europe'; the multiple use of the word 'Europe' and 'the continent' when what is really meant is the bureaucratic construction that calls itself the 'European Union'. 'Europe’s parliamentary elections', for example. I have highlighted these in the text. The delightful notion that somehow the legacy of Erasmus (persecuted), Dante (persecuted), Goethe (aristocrat/autocrat) and Comenius (persecuted Czech nationalist) are part of 'Europe' or the 'European idea' is absurd. Even more so that they or the turbulent times through which they all lived are in some way the foundation of the European Union bureaucracy (the word comes from French, of course). In German, certainly, the word 'Europa' has only recently come to mean anything more that the geographical continent of Europe. 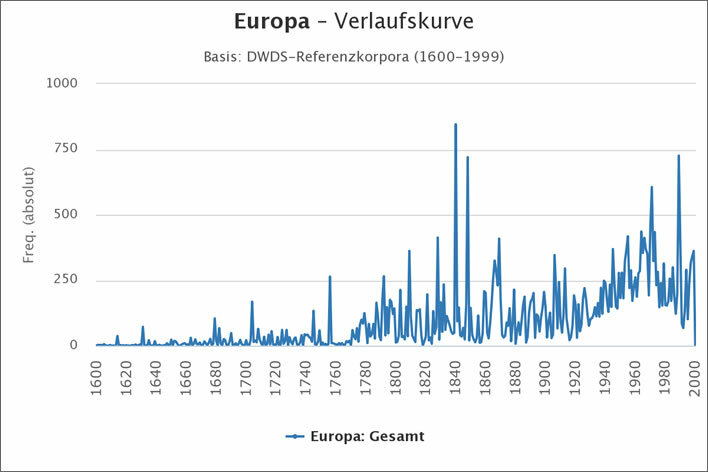 Let's look at the frequency chart of the occurrence of the German word Europa, 'Europe' in the text corpus of the Deutsches Textarchiv for the period 1473–1927. As might be expected, very similar results are obtained for word variants such as europäisch. The chart shows us firstly that the word Europa is really quite modern. The historical sages mentioned by Lévy – Erasmus, Dante, Goethe and Comenius – (admittedly of these only Goethe was writing in German) would have no idea of Europe beyond its use as for a continent and a mythological lady abducted by Zeus in the form of a bull. Nor was there any 'German state' at the time to participate in this continental union. The idea of Germany (other than as a linguistic entity), let alone Europe (other than as a landmass), would have been quite alien to all of them. The peak between 1760 and 1860 was a time of Napoleonic dominance, followed by revolutionary unrest across the continent, so causes us no head scratching. The great events of the time were all on a European scale. After the 1930s the National Socialists couldn't care less about Europe – they wanted a greater Germany. The modern fuss about Europe began in the 1950s with the birth of the European state. It is a postwar political construction, not a cultural entity. Lévy's attempt to reach back to some 'European idea' that encompasses more than half a millennium of history on the continent is simply absurd. Some time around 1950 is about as far back as that particular idea goes. It is also amusing to observe our French philosopher trying to compile a list of luminaries without a Frenchman in it. We end up with a Dutchman, an Italian, a German and a Czech – the giants of the French Enlightenment forgotten in the multicultural cause. That's what all this pan-this and pan-that does to you. It obliges you to subsume your own identity and culture for the greater good, the greater morass. But… But… Can even a rive-gauche Marxist lunatic write as sloppily as this? There was a time when French was regarded as the language of precise expression. We had better consult the French text as it appeared in Libération. Here are the paragraphs in question, with an accurate, if inelegant, English translation. From all directions criticisms, insults and betrayals are increasing. To put an end to the European construct, to find once more the 'soul of the nations', to reconnect with a 'lost identity' which often only exists in the imagination of demagogues is the shared programme of the populist forces that are spreading across the continent. Attacked from within by malignant prophets drunk with resentment and who believe their hour has come, detached externally from the two great allies across the Channel and across the Atlantic who have, in the twentieth century, twice saved us from suicide, subjected to less and less concealed manoeuvres by the master of the Kremlin, Europe as an idea, as will and image is breaking apart before our eyes. And it is in this harmful climate that the European elections will take place in May, which, if nothing changes, if nothing comes to stem the wave that swells and pushes and rises and if, very soon and all over the continent, a new spirit of resistance does not manifest itself, risk being the most calamitous we have ever known: a victory for the wreckers; a defeat for those who still believe in the heritage of Erasmus, Dante, Goethe, and Comenius; contempt for intelligence and culture; explosions of xenophobia and anti-Semitism; a disaster. There you are – that's better already. Still bonkers, but now discutably so. Conclusion: for those who want to argue with Lévy's piece, you should argue with it in the French original. We claim no elegance for our translation, but at least it is a great improvement on the tosh that appeared in the English-speaking media. In the French original there is still a running confusion between 'Europe' as a rhetorical device and what is really meant, the 'European Union' and there are many other confusions as well. But that's enough humour for the moment. Let the flies keep their wings for a bit longer. The curious should read the rest of it at the links above in bonkers French or extra-bonkers English respectively, according to taste. All the published languages are available at the Libération link. The German version is mad in its own way, which fact leaves us with the impression that the various language versions of Lévy's original were not translations but re-writes, done, presumably, by the local intellectual.